Who made the messages... and how?? Totally weird, right? It's hard to figure out what it means... although it seems like the person behind the tiles literally wants to bring the dead back to life on the planet Jupiter. The content of the message isn't the only mystery to be solved, either. No one is totally sure who is doing it, or if it's one person, or how they're doing it all without ever being seen. Most of the tiles appear in the Philadelphia area and in surrounding cities. Boston is the city furthest east with authentic Toynbee tiles, and Kansas City is the furthest west, although copycats can be found across the West Coast. Several authentic ones also appear in South America. Speculation holds that the tiler drops a tar-covered package containing the tiled message through a hole in a car floorboard and drives off, allowing the tires of other cars to push the tile into the pavement and wear off some of the tar. They've been around since the 1980s, and people generally accept finding authentic new Toynbee tiles through 2007 or so. 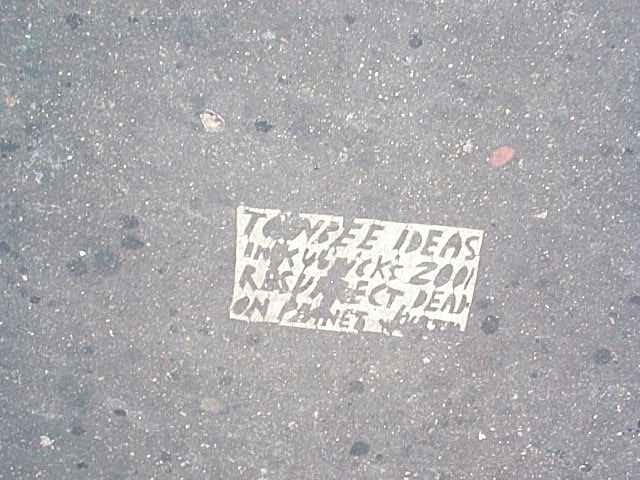 Here's a guide to finding Toynbee tiles across a few major American cities, in case you want to investigate the utterly strange mystery for yourself. 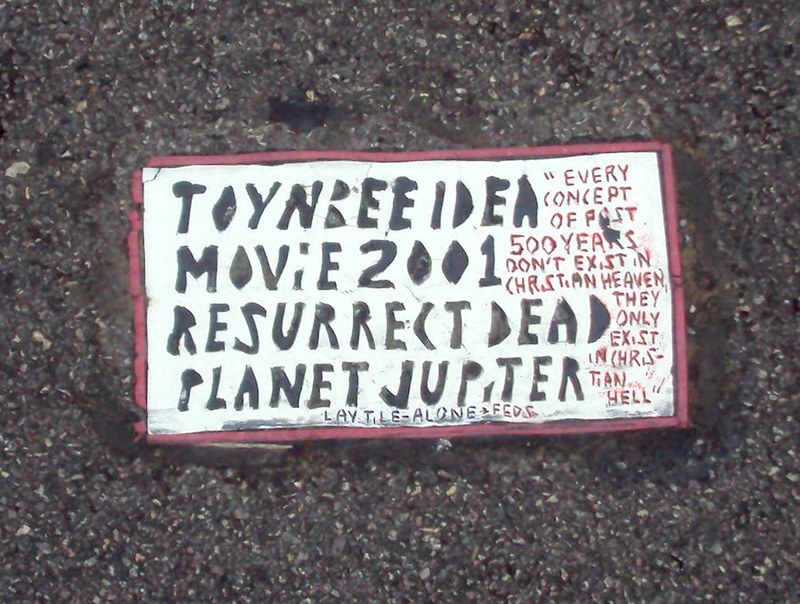 As stated above, the heaviest concentration of Toynbee Tiles is in Philadelphia and the surrounding region. If you start at Dilworth Park near City Hall and work your way south, you should run into one at pretty much every intersection. Chestnut Street is especially notable for its numerous tiles... just stroll up the street and spot them as you go. Boston is the furthest east the tiler ever got, and if you want to spot some of the mysterious messages he left, take a walk around the perimeter of Boston Common. There's one at Temple Place and Tremont Street, one at Charles Street and Beacon Street, and one at Arlington Street and Commonwealth Ave. If you're in Philadelphia, cruise down I-95 to spot more tiles on your way to Baltimore. There are a bunch in the city's center, around St. Paul Street as it turns into Light Street, and along Lombard Street. You'll also find two outside Camden Yards. If you're not convinced that the tiler is a mad genius, then seeing the number of tiles he's planted across NYC without getting caught will probably convince you. There are dozens up and down 5th Avenue alone! Walk north or south from the Empire State Building and you'll see what I mean. They're mostly found around Midtown Manhattan... the guy even has one or two in Times Square! The tiler also has no less than 4 tiles within a few blocks of the White House in Washington DC as well. 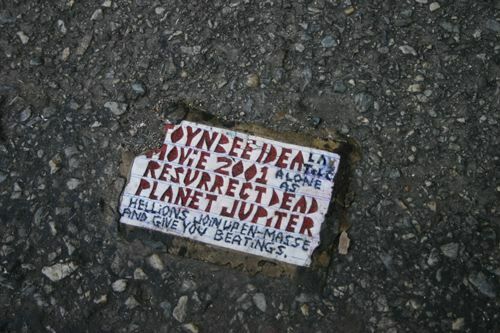 You'll find most of the DC Toynbee tiles between 15th and 13th streets. 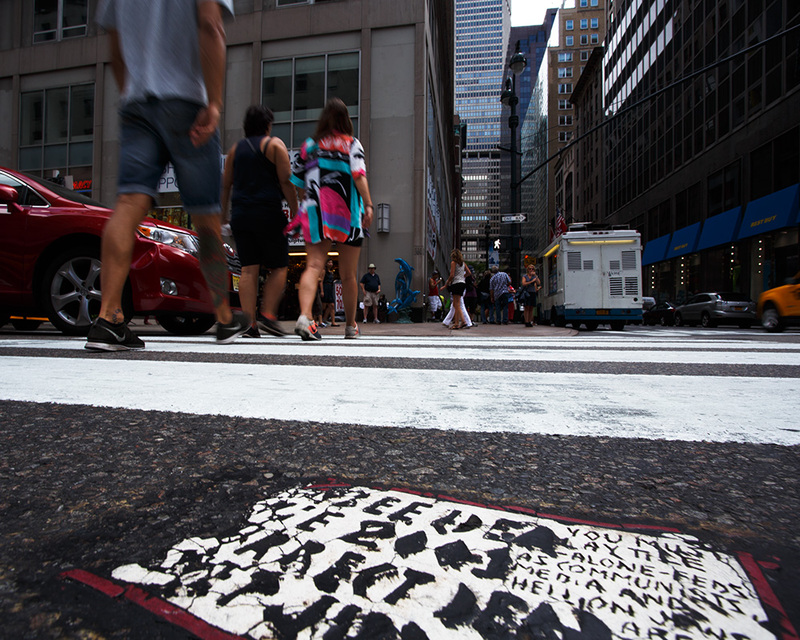 Besides the hundreds of tiles in Philadelphia and one tile in Harrisburg, the only other place to see Toynbee Tiles in Pennsylvania is in Pittsburgh. Two of Steel City's tiles can be found at the edges of Mellon Square: one at Smithfield and 6th, and another at Smithfield and Oliver. Cleveland also has some Toynbee Tiles-- three, to be exact. One is near Playhouse Square, at 12th and Euclid, another is at West 3rd and Prospect, and the last is at Tower City Center. There are a few Toynbee Tiles in Detroit, including one across the street from the Michigan Soldiers and Sailors Monument at Bates and Cadillac. Another is a few blocks away, at Randolf and Congress, and two are on Woodward, one at Larned and another across from City Hall. The tiler also left his mark in Columbus, near Ohio's Statehouse. Head to 3rd and Broad to see the strange message. If you make your way to Cincinnati's Fountain Square, you'll be super close to two tiles; one is at 5th and Walnut, and the other is a block away at 6th and Walnut. There's also a battered tile at 4th and Main, not too far away. Indianapolis boasts two Toynbees, both on Meridian Street. One can be found at the intersection with Maryland across from the Hard Rock Cafe, and the other at the street's crossing with Georgia. The first is a more simple design, containing the classic message, while the other is more intricate, with a set of ladies' legs outlining the corners and a little add-on with instructions on making and glueing the tile and a weird message about the media in the USSR. 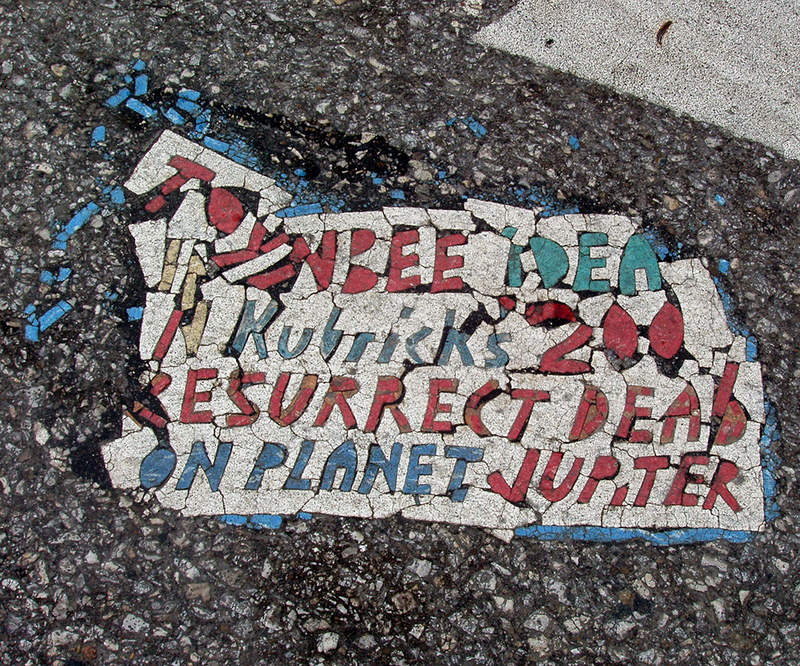 Alright, so visiting as many Toynbee Tiles as possible will probably leave you with more questions than answers. If you're looking for more information, the documentary "Resurrect Dead" is a great place to start. They have theories on who is behind it, and why. 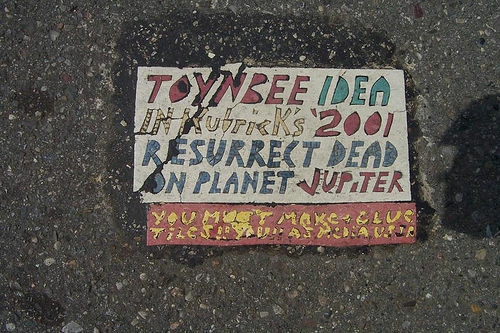 You can also go to toynbeeidea.com to see a map that lists the exact location of just about every Toynbee Tile. We'll probably never know the full story behind the tiles at this point... but let's be real, the speculation is way more fun than the truth.